The company headquarters is situated in Tournon, and as you might expect, provides a dramatic view of the Hill of Hermitage. The joint venture started out life with the plan to produce and sell their wine under the name of Jaboulet, Perrin Freres. That name was shelved once they discovered it was a problem to use the name Jaboulet on the label. The enterprising duo easily changed the name of their winery to Maison Nicolas Perrin. It’s too early to say all the rest of history. But with the pedigree involved here, it’s quite likely, they will be making history in the near future. The first releases from Maison Nicolas Perrin began with the 2007 vintage. 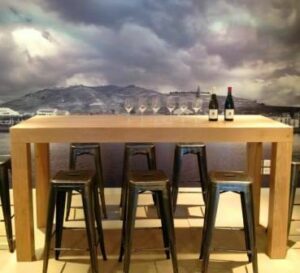 They are focused on producing wines from the Northern Rhone Valley as they are making red and white wine from Cote Rotie, Hermitage, St. Joseph, Crozes Hermitage, Cornas, Condrieu and St. Peray. Nicolas Perrin is also producing lesser priced wines from a blend of Syrah and Viognier. The responsibilities for Maison Nicolas Perrin are equally divided between the families. Much of the wine making is being handled by Nicolas Jaboulet, while the blending and then bottling is being taken care of by Marc Perrin. Marc Perrin, with his years of experience blending 13 different grape varieties to produce Beaucastel is more than up to the task. Although, it is a bit of a challenge to blend the various terroirs, instead of grape varieties. At this early stage, Maison Nicolas Perrin purchases wine from a select group of growers. Maison Nicolas Perrin provides the barrels and is responsible for the barrel aging, blending, bottling and sales of the wines. The bottling is being handled in the Southern Rhone, with the hopes that the wines will be aged in the Northern Rhone. The blending of the various vineyard sources is the key to the success, quality and style of the wines. To produce the wine of Maison Nicolas Perrin, as negociants, they are dependent on the growers and sites they buy from. Having two of the most famous names in the Rhone Valley helps. Maison Nicolas Perrin Ermitage Rouge is produced from 100% Syrah planted in Dionnieres, Greffieux and Murets, which share a terroir of granite, gravel and limestone soils. The wine is aged in 30% new, French oak barrels and stainless steel tanks for an average of 15 months. Maison Nicolas Perrin Ermitage Blanc is a blend of 65% Marsanne and 35% Roussanne from vines planted in the Maison Blanche and Roucoules lieux-dits. The wine is barrel fermented using 33% new, French oak. The initial offerings from Maison Nicolas Perrin were about 2,500 cases in total. It is expected to ramp up to close to 7,500 cases before long at this fast growing negociant company. Maison Nicolas Perrin Hermitage when young, should be decanted at least 2-3 hours, give or take, allowing the wines to soften and open their perfume. Older vintages might need very little decanting, just enough to remove the sediment. Maison Nicolas Perrin Hermitage is usually better with 10-12 years of cellaring and should be at its best between 12-25 years of age. Maison Nicolas Perrin is best served with all types of classic meat dishes, veal, pork, beef, lamb, duck, game, roast chicken, roasted, braised and grilled dishes. Nicolas Perrin is also good with Asian dishes, hearty fish courses like tuna, mushrooms and pasta. The white wine of Maison Nicolas Perrin is best served with a myriad of different seafood dishes, shellfish, crab, lobster, sushi, sashimi, chicken, pork and veal, as well as Asian cuisine.